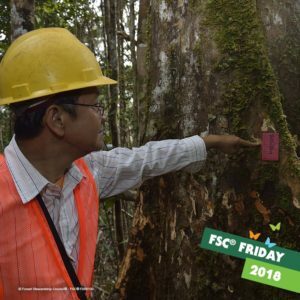 Last Friday it was FSC Friday, a yearly event organized by FSC to put the importance of certified wood in the spotlights. As a company we use both FSC and PEFC certified wood, knowing it’s better, but not being aware of the actual benefits. Did you know for example, using FSC certified wood is better for forests than refraining from using wood? You’ve probably heard it before, around 36 football fields of wood disappear every single minute. This happens mainly in tropical forests in the South American Amazon, the African Congo basin and Southeast Asia. Deforestation accounts for 15% of global CO2 emissions on an annual basis and therefore plays a major role in climate change. In addition, 80% of all animals in the world depend on the forest, as well as millions of people who live or work in the forest. Stop using wood, you might think. Well, actually the solution is the opposite. First of all, logging doesn’t only happen for wood, but also for soy, palm oil and mining. Refraining from using wood will therefore not completely take away the problem. Using certified wood actually means working on a solution. Of course certified wood is cut down as well, but in a responsible way. The aim of responsible forest management is to protect the habitat of plants and animals and respect the rights of the local population and forest workers. But also harvesting wood and earning money while preserving the forest. A well-managed forest is less risky to be cut down for other purposes, such as the construction of palm oil or soy plantations and mining. The more demand there is for certified wood, the more woods can be managed in a responsible way and therefore saved. Imagebuilders is more than willing to help you create and produce the right products. With switching to certified wood, you can definitely make a difference!